Brandy Amstel appears in the documentary Enlighten Us: The Rise and Fall of James Arthur Ray, directed by Jenny Carchman. Enlighten Us premieres Thursday, Dec. 1 at 9:00pm and 11:00pm Eastern on CNN/U.S., with limited commercial interruptions. Enlighten Us made its world debut at the 2016 Tribeca Film Festival in New York City in April and also screened at Telluride Mountain Film Festival in Colorado and Tallgrass Film Festival in Kansas. Living Powerfully with Brandy Amstel streams live Monday through Friday on Periscope @BrandyAmstel and FaceBook Live @LivingPowerfullyNow. The show explores what it means to live powerfully in all areas of life NOW, not someday in the future when everything is perfect or you have all the resources and contacts… but NOW. Each day Brandy breaks life down into a different area of life and gives her perspective with an invitation on how others can take their lives to the next level in that area. Monday’s she talks about Spiritual/Mental Health, Tuesday’s Wealth/Contribution, Wednesday’s Wellbeing/Physical Health, Thursday’s Love/Relationships, Friday’s #ReflectionFriday with a recap of the week and an opportunity to name and claim the accomplishments of the week publicly. Brandy often explores within the context of the different areas how people tend to give their power away without realizing it, how to take their power back, how to make informed choices to create a life by their own design. Brandy speaks about taking responsibility for the environment, the quality of the water we drink, and the food we eat. She discusses image, dreams, authority, and ethics. She challenges people to ask questions that are empowering. Most importantly, she encourages people to follow their intuition. Brandy’s live-streaming shows offer today’s health-conscious, environmentally concerned “cultural creatives” the information they need to practice inspired living. The idea came about as Brandy Amstel traveled her journey through life experiencing and uncovering areas of her own life where she had given her power away and the realization of how important it is that people are awakened to life and educated about all the nuances to be able to make a powerful choice instead of going through life pretending that there is something outside of themselves that is creating their experience. She feels like people give their power away by blindly trusting the government, doctors, pharmaceutical companies, and feels a show that challenges people to ask questions will empower people to consciously create their life. Brandy Amstel shares her experiences in the infamous, “Sedona Sweatlodge” where 3 of her friends lost their lives and many others ended up in the hospital along with other tails of navigating the personal development industry. Brandy Amstel is featured in the Amazon best selling book, Fearless Women: Visions of a New World, which launched May 18, 2012 with a 15 city world wide book tour beginning in Los Angelos traveling throughout the US, Canada, London and then finally ending in Uganda with the Fearless Women Global Summit. 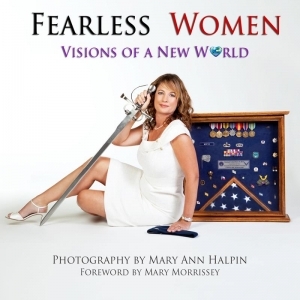 Celebrity photographer Mary Ann Halpin photographed 50 women throughout the world that are making a huge difference. She was inspired by words from the Dalai Lama at the Vancouver Peace Conference in 2009, “The world will be saved by the western woman.” Now is that time. 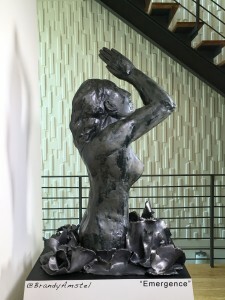 Brandy Amstel creates transformational experiences through sculpture, painting, film, events and private VIP days. Link to Brandy’s art work currently available or to commission a piece of art that expresses your personal truth. Living Powerfully Salons – Brandy leads conversations on various topics. Check here for Upcoming Topics of Conversation.